Archery is offered at the times listed below. All activities, except for a few travel team matches, take place at the Boys and Girls Club of Meriden, CT., or at Cuno Camp, also located in Meriden. Youth, ages 9 & up, can come down to shoot for the fun of it or for competition. Youth must take a beginner's lesson if they haven't shot at the Club or at Cuno Camp before. Lessons are offered by appointment throughout the year. Contact Dominic for a lesson. Youth can come down to shoot for practice, to work on their technique, or just for the fun of it. Archers will receive instruction. General shooting is held Thursdays and Fridays during September, October, and November. In April and May archery hours may be different, so check the schedule below or contact archery@bgcmeriden.org. Sessions do not have to be used consecutively. Archers can make appointments to shoot at the times listed below. Appointments are recommended, and are on a first-come, first-served basis. Contact Dominic to make an appointment. 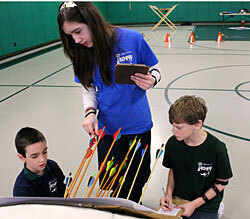 While shooting for the "bull's-eye," young archers can work on their Boys and Girls Club ranking. The Club’s 13-level ranking system is designed to help archers gauge their skill level and have a goal for which to strive. Each archer will receive a certificate upon completion of each ranking session in which they achieve either the same rank or a higher one. During the winter months, archers ages 9 and up can join our archery league and compete against teams composed of other Boys & Girls Club members. The league runs from December through mid-March. Archers can shoot for their team during regular shooting times, shown below. Awards are given to the championship team, leagues' top shooters, and each team’s top shooters. Archers need only shoot once a week for about 50 minutes, although they can shoot longer if time permits. Registration is in October . Archers with a ranking of blue or higher can shoot against other archers to earn awards. Archers can shoot during any of the drop-in shooting times. Targets and other objects designed to challenge their skills are shot during a one-hour time slot. Awards are given to the top archers in each ranking level. Advance registration is highly recommended, and a small fee may be charged. Fun and challenging events such as balloon popping and knocking over plastic bottles are held during Wednesday and Thursday drop-in shooting a few times a year. Advance registration is highly recommended and a small fee may be charged. Youth in 6th grade or higher with a minimum of a yellow rank may choose to join the travel team. 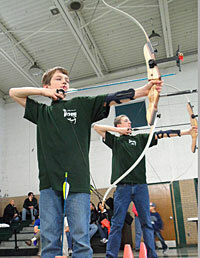 The travel team competes against other local archery clubs in home and away matches. For further information contact archery@bgcmeriden.org. 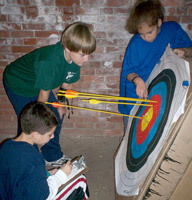 All Club archery programs are taught by Sr. Program Director Dominic Pereyo, a CT State Certified Archery Instructor and a US Level 2 Archery Coach. Dominic has been teaching archery at the Club and Cuno Camp for over 20 years and has a sincere passion for the sport and teaching it to youth. Contact Dominic Pereyo, dominicpereyo@bgcmeriden.org, at 203-235-8185 for further information.